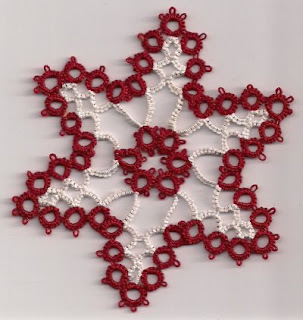 Before Christmas I was looking for a simple snowflake pattern to include with my cards. I found this one in Anne Orr's Classic Tatting Patterns and when working it for the first time I decided to add beads, with a very pleasing result. However, it took ages to make, particularly because the pattern is written one row at a time with continuous instructions in small print which made it hard to follow, then adding beads caused more problems! In the end I was forced to draw a diagram to help. It was clear though that this was not going to be a quick pattern to tat and even making it again without beads was still quite slow, although if I had persevered I would have become faster, but then Jane's butterfly pattern flew into the scene and I was smitten! Just before Christmas though this delightful snowflake (below) arrived through my door with sparkling beads on, it came from Tatskool - thank you very much Pamela, the thread may be her own rasberry sorbet? Not sure, but it is very pretty. I have never taken part in any exchanges but have enjoyed watching those that have taken place, especially the "Secret Santas". 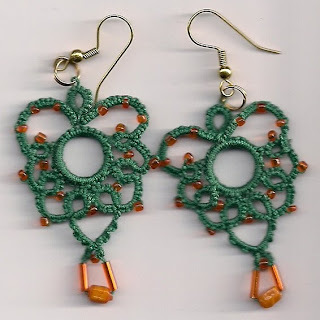 It is good to see the generosity of all the tatting people and a little bit of the culture of the country they originate from woven into the gifts. 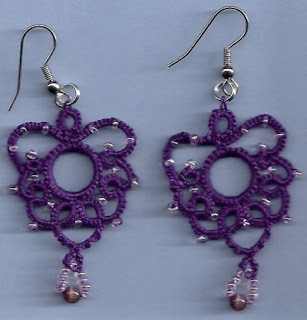 Obviously to find time to do even more tatting! "Sweet Singing in the Choir"
Here is a little choir boy that I made many years ago out of patchwork, the pattern comes from a book published in 1976, but it remains a favourite of mine, although these days I don't have time to make items from it. The book is entitled "Patchwork Playthings" by Margaret Hutchings and in the middle of the book are all the templates for the toys, there is so much work involved that you would hardly call them toys. This little fellow has been up in my attic and I brought him down for Christmas and tatted around his surplice to give up a fresh and sophisticated look. Over the last few weeks I've attended quite a few carol services, but none of them had a proper church choir, with choir boys in. Thankfully our English Cathedrals still have their own choirs, and now also have girl choristers. One of the most loved traditional Christmas festivals is the 'Nine lessons and Carols' which is broadcast every Christmas Eve from Kings College Cambridge and in candlight it is truly a delightful service. The title for this post comes from the carol "The holly and the Ivy" the chorus ends with these two lines "The playing of the merry organ, Sweet singing in the choir." 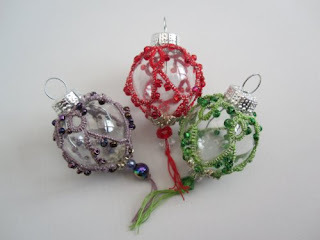 I purchased these tiny glass baubles last year after Christmas, I found them reduced in price in the Hobby Craft shop and thought that something could be done with them! So in January this pattern was born, but like all my patterns it ended up on a scrap of paper, somewhere! I've just revisited it and written the pattern down. 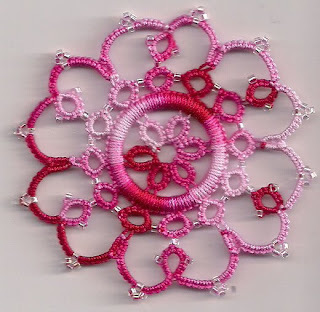 It took longer than expected because the metallic thread that I had been using had untwisted itself off the reel and was in a mess, when I eventually wound it together with the tatting cotton on to the bobbins it really wasn't fit to use. 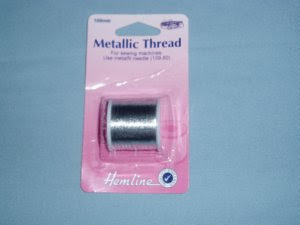 So after two aborted attempts I opened the new metallic thread. They are really pretty and sparkle when the lights are on the tree, so far I haven't dropped one! As I have no drawing programme this is it finished before it is attached to the bauble, a very simple design but as with all designs, and especially this one, it had to fit comfortably over the bauble. So here is the pattern and a picture of the thread I bought, this particular one is recommended as it does run smoothly (unless you abandon it for 10 months!) other threads are not so easy to work with. 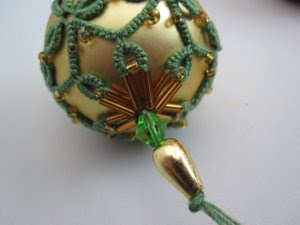 To complete fit over the bauble and thread a piece of tatting cotton through the gap made between three of the six beads continue through the rest of them and draw up tight then add a large bead or beads, thread more cotton through the pulled up beads and through the dangle beads, knot close to the beads making a tassel. The pattern for these baubles is now on this blog, its taken me ages to get it sorted, I've had to be dragged away from the butterflies (for which I blame Jane), as well as the usual Christmas preparations that have taken up my time, including of course preparing for carol, christingle and other church services. Looking at the photograph it seems to be on its side! Well it doesn't really matter, because I'm sure you can see them well enough. In fact if you enlarge the photograph you can just see a reflection of Jane's hands in the shinny baubles as she takes the picture. 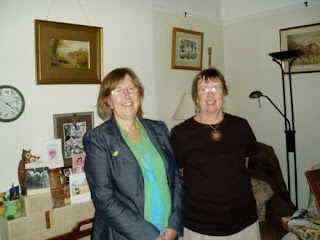 She kindly took the photographs for me earlier on in the year. Which just shows how long this project has been on the go! 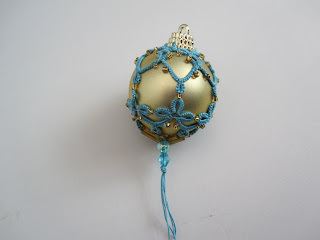 Of course baubles come in all shapes and sizes, this particular one is about 1 1/2" but its relatively easy to adjust the stitch count. The one thing you have to do is make sure that it fits "like a glove" otherwise you loose the effect when you draw a thread through the bugle beads. 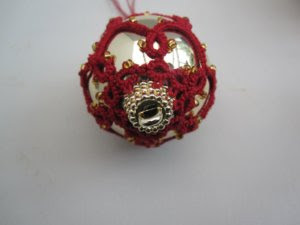 This is a smaller bauble and I had to alter the pattern to make it a cosy fit, will write it down some time in the future. I think the black on gold is very effective and I plan to make a lot more when Christmas is over! 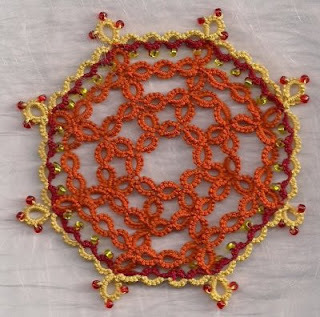 The tatting looks quite strange at this stage but it is designed to fit over a 1 ½”bauble by adjusting the stitch count it can be adapted for other size baubles. 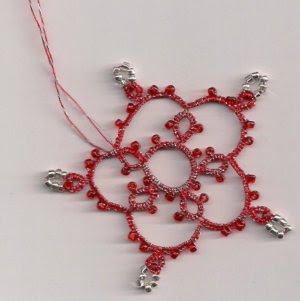 Once the tatting is fitted over the bauble thread a piece of tatting cotton through the gap made between the two bugle beads continue through the rest of them and draw up tight then add a large bead or beads, thread more cotton through the pulled up bugle beads and through the dangle beads and knot close to the beads, so making a tassel. 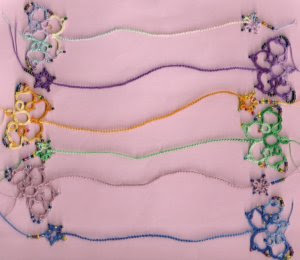 I don't know how many of you have been over to Jane's blog today, but she has posted her new butterfly bookmark pattern. She showed it to me the other weekend and it looked so beautiful that I just had to have a go. Well we have both been absolutely hooked on making them. The ones you can see below have all flown away to different parts of the world, as I've put them in with Christmas Cards. It is a very clever pattern and one of the reasons I like it so much is that I've manged to use up some beads where the colours have got all mixed up due to spillages. 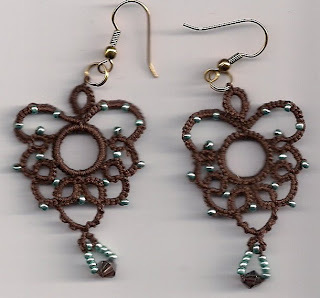 Being Jane's sister means that I get to know tatting projects (although not all) before you do! 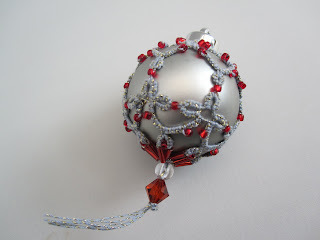 Which is one of the reasons why I have not had enough time finalise the bauble pattern yet! But promise it will be the next post. Today is the feast of St. Nicholas, although this bearded gentleman also goes by the name of Santa Claus or Father Christmas and is known for his red fur trimmed cloak. 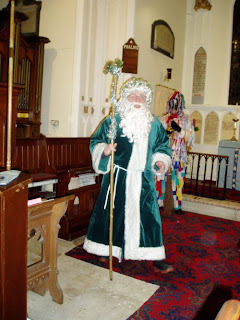 Yesterday we were treated to a Mummers Play in one of the churches. The Father Christmas you see in the picture is dressed in green, said to be a sign of the returning spring and he is known as Old Father Christmas, still quite a jolly fellow! His companions were St. George, a Turkish Knight, The Doctor and Johnny Jack. The origins of these English plays go back in the mists of time but are said to be pagan. However, I don’t think there is any harm in seeing them being performed in church . After the performance one of the Mummers read out an interesting fact that had been sent to them (via the Internet). Apparently there is a painting in water colour in existence that shows Mummers performing in the late 19th century in the very village where this church is. The picture was painted by the son of a former famous village resident, so its good to see traditions revived especially on a dark, rainy cold December afternoon. St. Nicholas was Christian Bishop of Myra, a seaside town in what is now Western Turkey in the early fourth century A.D. There are many legends about this bishop which have been passed down over the centuries and have probably been embellished and expanded far beyond the actual facts, though they may contain some elements of truth. St. Nicholas was very kind to children and has become their Patron Saint. When living in Germany I well remember this day especially seeing a Father Christmas on the street giving sweets to the children. St. Nicholas is well respected, in many European countries. This is another picture of a Christmas bauble, this time in a Father Christmas suit! I am a little nearer to posting the pattern only the last few days have been very busy so I’m struggling to get it written down in a clear and concise manner. I tatted around these baubles earlier this year, in fact it was January when I thought of the design and a couple of weeks ago I picked it up again to make a few more. If anyone is interested in the pattern I've just about managed to write it down, but sorry can't do drawings. Its basically tatted in two pieces. The silver one is tatted with Altin Basak cotton 50, not an easy cotton to work with but quite effective when used in a decorative way. These baubles have a matt finish, I will show you some shinny ones next time, photographed at a different angle so you can see more detail. I've actually stopped making them because Jane has just created another fabulous design and I have sort of got hooked on it! Anyway I'm sure she will show you soon. Here we are together, yes I'm on the left and big sister is on the right, she always looks so scared of cameras doesn't she? 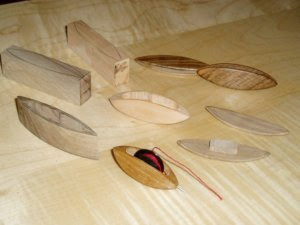 This weekend I went to see Jane and took the shuttles that my husband had made for a "tat test". Unfortunately there are a few design problems, so its not exactly back to the "drawing board", but a little disappointing after all his hard work. Still he is undeterred and is now going to make some modifications. I can report that there is going to be a wonderful gadget to go with the shuttles, that will be unique, and with more suggestions regarding its design from Jane it looks like being a very useful tool. Now you are all wondering what I'm talking about. I'm not sure when I can show you some more pictures of the shuttles, its a case of how often I can shut my husband in the garage! I received an e.mail from my son yesterday, informing me that the parcel from Aileen "Wicked Tats" had arrived and he has kindly taken a photograph of the contents. These were from her Halloween Giveaway, the first time I had ever won a prize from a blog giveaway and it will probably be the last! Thank you Aileen I look forward to seeing them soon. My son lives in Singapore and so will forward the goodies with our Christmas Presents. Actually he is going to visit Hong Kong in a few days time so I might send him to do some shopping there. He spent the first two years of his life in Hong Kong so although he will not remember the place he has promised to take photographs so we can see how it has changed over the years. 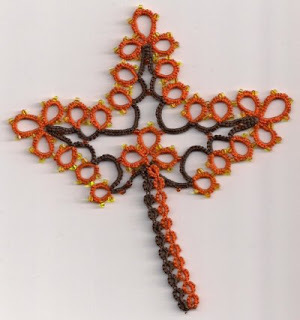 Today is St. Andrews Day - he is the patron saint of fishermen and there is an obvious connection to tatting, because the German word for tatting is Schiffchenarbeit which translated is "the work of the little boat". St. Andrew is of course the Patron Saint of Scotland so I wish them a Happy St. Andrews Day. Tomorrow is St. Catherine's Day, she is the patron saint of lacemakers and as we tatters don't have our own patron saint, she is perhaps the one we should adopt, and so of course she gets a special mention in Tat's Heaven! For lacemakers today was known as "Cutting Off Day" when they cut off and sold the lace they had made. Originally lacemakers would produce only one pattern, with which they had become conversant. This would have been worked in one continuous piece, the lace dealer would take the lace from each pillow and pay according to the length produced. There were quite a few traditions in areas where lace used to be made. 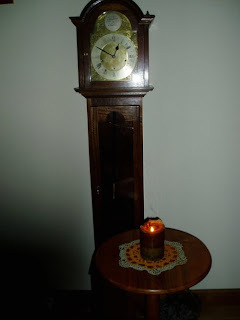 In the evening a lighted candle was placed on the floor and each girl would jump over it - if she extinguished the flame, then ill-luck would follow her for the rest of the year. The belief that flame could purify one's life and that by passing through fire then luck could be changed is an ancient one. Kit jump over the candlestick. St. Catherine herself lived in the 4th century she was reputed to be beautiful and intelligent and of noble birth. However, she was persecuted for her Christianity and was tortured by being put on a spiked wheel and turned, but it broke so she was beheaded. The firework "Catherine Wheel" is named after her - a representation of it is shown above. I found the pattern in a old ROT book but of course changed it a little and added some beads to make it look as if it was on fire! Here in this part of "Tat Land" there is a lot of work in progress, some of it is on this tray. Now there is a story behind this tray, about three weeks ago someone was clearing out a cupboard at church and found this dear little tray, which measures 10 1/2" x 7", and as it was not wanted I claimed it straight away. It has now become a "Tatting Tray." I put a bead mat on it so the beads don't runaway and it is ideal. Actually seeing what is on the tray reminds me of "Kim's Game" - the rules are you put some items on a tray and ask the participants of the game to turn away and then you remove a few items, when they see the tray again they have to guess what items are missing. Trouble is if the game was played on a blog you would all cheat wouldn't you?! On this tray you can see a bead container, my wooden needle holder, a Christmas bauble just about to be finished, shuttles, wedding hearts, earrings and another piece of tatting to cover a bauble. This is Wicked Tats tray, which she will obviously never loose as it is a lovely bright colour! I took this photograph this afternoon, pinched them from the garage, sorry its all I could smuggle out! 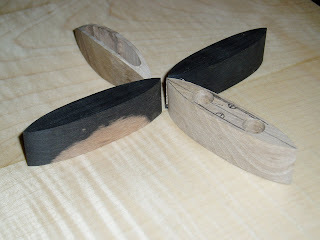 Don't you think the ebony shuttles are going to be gorgeous? The shuttle making process is a little slow, due to a few set backs. My resident shuttle maker, aka husband, started with making the traditional shuttle, but has found that because the middle section which takes the thread, is so small, it is a bit awkward to get exact, he says he needs another tool, but that is always the case when starting new projects! Also he had to steam the wood and clamp it in some moulds so it curves and that took a time to work out and set in motion, especially making sure that when they come into the warmer temperature of a house they do not loose their shape. 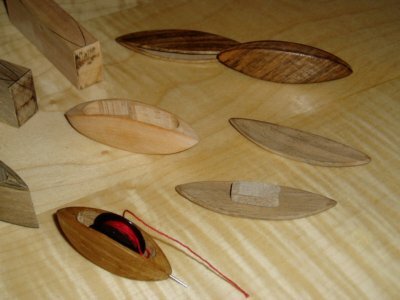 The first one did not meet at both ends when assembled but the second one is much better (top right) and the picture shows another one (far right) just about to be assembled. He now thinks he has solved all problems concerning this model. The next attempt was to make a shuttle that would take a plastic bobbin, and that project is progressing well. The picture shows the blanks that he is cutting these from (far left) and one nearly completed (middle) it now needs some fine sanding, but we are awaiting another piece of equipment so that he can get into the crevasses, yes and it has something to do with teeth! The shuttle with the bobbin containing red cotton is the first prototype, and includes a hook, which he fashioned from a clock pin as we could not find very small hooks anywhere, well not without mutilating a decent looking full length crochet hook! 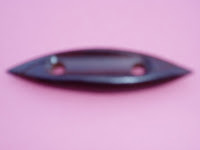 He made a fantastic job with this hook using a watch maker’s lathe, and there are no rough edges on it. Another purchase that he has just made is some stainless steel wire with which he hopes to fashion some more hooks from. Although I have to say this particular shuttle is a little small and occasionally slips from the fingers as there isn’t enough grip, but it is usable. A future plan is to make a facility to wind a bobbin on the end, just as the aero shuttles have. Not sure how well the shuttles will eventually turn out, but hopefully a few will be completed before the end of the month so that when we visit family we can take some with us. That means big sister Jane, Queen Jane, Janie-Lou - you are going to be the “Shuttle Tester”. No pressure! Is when we remember those who have died in the First World War (known as the Great War) and the Second World War and in all conflicts since then in which our armed forces have been involved. At the eleventh hour on the eleventh day of the eleventh month the armistice was signed in 1918. On Sunday Remembrance Services were held and a two minute silence was observed at 11 O’clock by war memorials up and down the country including the cenotaph in the middle of London. In our village a service was held at one church and then we took a 20 minute walk to another church where we stood outside the war memorial, the church itself is not large enough to hold all who attend. On the war memorial are the names of those who died in the two World Wars and who used to live in the village, after the silence a bugle played the last post and poppy wreaths were laid by the memorial. I officiated at these services and before hand asked the Scouts if they would like to write some pieces to be read out during the service, based on the present troubles in Afghanistan and this is one of their contributions. I pray, I pray for war to end. We wear the red poppy to remind us of the poppies which grew in the battles fields after the Great War. The sale of them raises money for the Royal British Legion helping ex servicemen and women and their families. I made this poppy by following Martha’s flower instructions here, it took about three attempts and even the final result is not brilliant as it is so hard to keep the tension exact for every petal. After a few days of windy rainy weather in this part of the world the trees have nearly lost all their leaves, it has been a beautiful sight watching the changing colours, especially living on the edge of the New Forest. The picture below does not really do the area justice but as is always the case, the camera is never at hand when needed! The tatted leaf took me ages to make, as I kept moving onto different projects, its the maple leaf by Tammy Rodgers which many people have made and so is very recognisable. 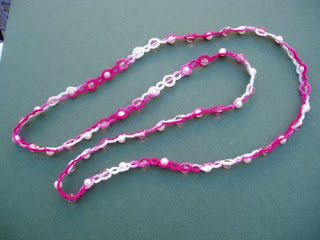 However, I extended it and added some beads, and also made the stem out of split rings. 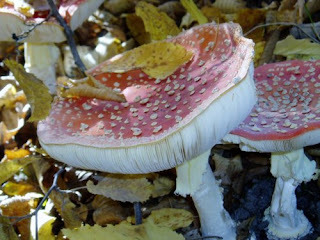 The picture of some spectacular looking toadstools was taken in the village where I live very near to the doctors surgery just off a pathway, totally amazed that children hadn't destroyed them. By the side of them though was an abandoned empty cardboard box which once contained beer. So there must have been some very drunk fairies dancing around them! But they are so pretty especially with the leaves falling on them. Now I know what you are thinking, she is talking about religion. Well I’m actually referring to spreading the word about tatting, although church has a prominent part to play in this for it is where I meet a lot of people. Yesterday was All Saints Day but in the evening we invited the bereaved to an All Souls service (which is really today) and the church was packed. At every opportunity I like to show people my work, and this is what I wear in church and at other services outside the confines of a church building, such as funerals which I conduct in a crematorium. I explained to our local funeral director what it was around my surplice, a couple of years later he informed me that he had solved a crossword clue because he knew the answer was “tatting”! 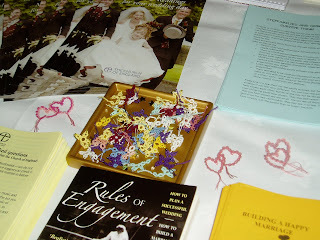 In one of our parishes we regularly attend a Wedding Fayre which is held in a hotel just down the road from the church. The hotel used to be an old manor house and it is surrounded by beautiful gardens. We are allocated a table and couples who visit the Fayre are invited to take some of our leaflets and ask about church weddings, we don’t book them at this stage. Anyway some have already booked their wedding either in another church or in a secular venue, but we still can give them help - perhaps in choosing music or readings. We used to be situated in a room in this hotel with a wedding photographer and a wedding car firm, which was fine but occasionally people would put their heads around the door and say “it’s the church” and make a very quick exit! This time our table was in a large room and beside us were two sisters who sing at wedding receptions, and so we were treated to their repertoire, they were very good, but it was a bit loud, especially when you were trying to hold conversations with people! 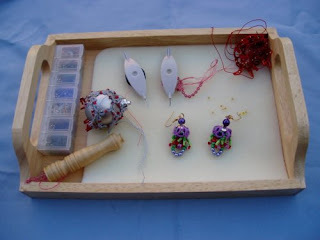 The picture shows some of the items on the table including of course “tatting” there are entwined hearts and in the gold container are crosses and butterflies, Jane’s patterns. We invite people to take these tatted items away and invariably that means questions are asked about how they are made. This necklace was made for a girl of about 12 yrs old who saw some of my tatting and has expressed a wish to learn how to tat, along with her mother, they are in the congregation of one of the churches I minister in – so that’s what I mean about spreading the word! One of the things you learn in Scouting, apart from knots (not tatting!) is to save the most extraordinary things, in the hope that one day they may come in useful for handicrafts. This is especially relevant, if like me, you are with the younger section, Beaver Scouts who are aged 6-8 years old. 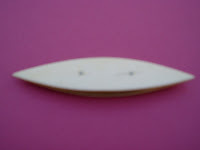 Twenty years ago it was difficult to find decent craft supplies, unless you were prepared to pay a lot of money for them, so over the years I have looked at disposable household items such as packaging etc and thought, what can this be used for? 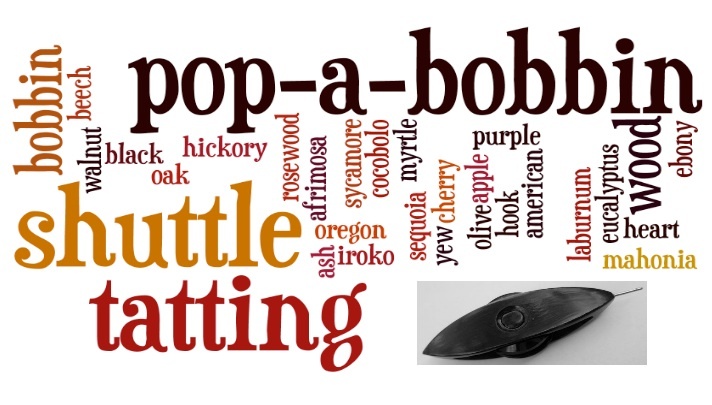 Corks from wine bottles are very versatile, although nowadays they seem to be mostly plastic, the original cork ones though could be turned into trains, dogs and even the beaver animal. So it sort of became a habit to collect items that showed potential! That is why I collected the plastic rings from the Oral B electric toothbrushes, not for Scouting but for my own use, and now they have been re-incarnated into earrings! I’ve been influenced by the patterns that others have designed using plastic rings and thought they looked great, many using HDT. Initially I took the tooth brush rings on holiday and had a play around, my first attempt was given to Tatskool and it is only in the last week or so that I’ve come back to the project with earnest, mainly because I would like to give some earrings away to friends for Christmas. So here are the results. It wasn't until I made the purple pair that I got the pattern as near to perfect as possible. Being constantly nagged by big sister I have even written the pattern down! Jane then gave me a few tips on how to write some of the instructions, and the result is the pattern below. I’m not planning on designing much as it is very time consuming and frustrating and I don’t have much patience. But the absolute delight in seeing a pattern that I have designed written down and in a readable format, instead of on a scrap of paper is wonderful! I hope someone may be inspired to have ago at this pattern and tell me if they do not understand anything, after of course they have cleaned their teeth! don't know what I am talking about. A plastic ring, I used the plastic ring from the Oral B tooth brush! But any small plastic ring will do although you may have to adjust the stitches to cover it. I won two shuttles on e.bay last week (yes still can’t break the habit! ), they were being sold by the same person but with four days between listings. The first one is a Vintage Bone tatting shuttle 10 cm in length, 2 cm wide and 1cm in depth and described by the seller as “lovely to work with even though a bit larger than average. 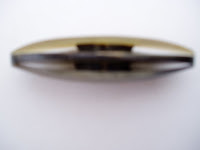 It is very comfortable and smooth in the hand.” She went on to say “a little stiffness in the fingers prevents me from using this shuttle now." It certainly is a larger than normal shuttle. Sad to think that as we get older ailments such as stiffness in the fingers may prevent us from tatting, hope that is a long time coming for me. 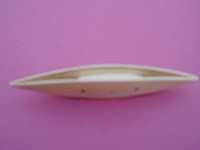 Another comment that was made by the seller was this "The top view shows a tiny mark that is in the bone itself. 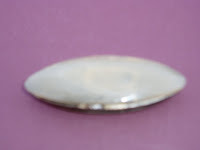 The other side shows small very fine hairlines where the pins are. This has been like this for a very long time and has occurred through natural use over many years." A well used shuttle, that is what I like to hear! The second shuttle was described as a horn tatting shuttle – double thread with two shanks for winding two threads. Again she says “Shuttle has nice tight ends, smooth to the hand when in use”. I have never seen a double one before and trying to think when it would be most useful. I was quite pleased with these purchases as they were both under £5 each and will now go into my collection although I might eventually find a use for the double thread one. I am trying to motivate my husband into making tatting shuttles, he made this one for me years ago, can’t remember where the design came from but it was definitely copied. Obviously the classic design would be better and as he has some small pieces of hard wood stashed away, they could be re-incarnated into tatting shuttles! Computed the square of infinity. So he dropped maths and took up divinity. A Limmerick to start off this post. not Edward Lear, but this is only the start! Trying to find a motif that would fit into this metal square wasn't easy, and gave me the fidgets! The samples in the first picture were part of the searching. The first two I found here, although the instructions for the second one do not correspond with the diagram, so if you plan to tat it make sure that on the corners there are six picots not three. The third one is one of Jane's designs, which she had completely forgotten about, so I'm sending her a copy and she might eventually put it on her pattern page?! To ensure the motif would fit the metal square I had to use 80 cotton. 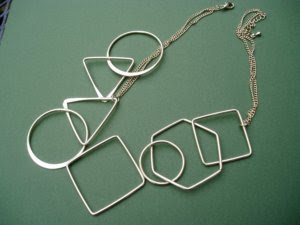 This is the necklace from which the metal square came from. I purchased it over two years ago, meaning to do something with it one day! Not sure now, that it is in pieces, whether anything else will be done with all the other bits. 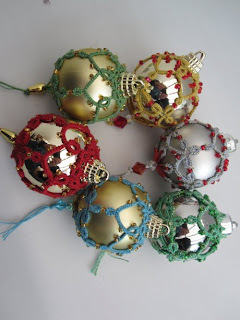 I could make some Christmas decorations though, any other suggestions gratefully received! 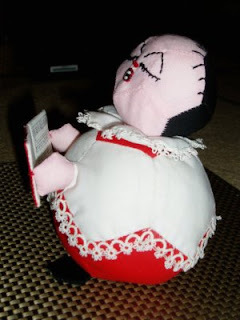 This is all I remember of the old nursery rhyme, but apparently it has more verses. 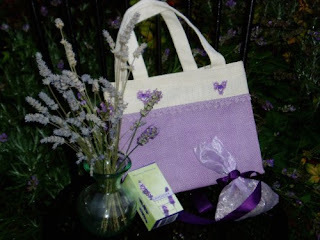 Lavender is one of my favourite plants, it smells beautiful and it is also so versatile. I've used it in cooking to give a unique flavour to biscuits and ice cream and of course in lavender bags to keep away moths from vunerable clothes. 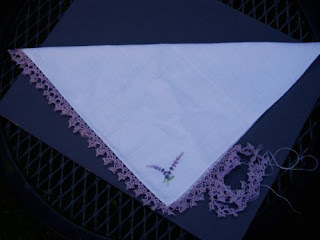 I started tatting the edging to the handkerchief whilst on holiday, taking some ancient cotton with me, I began to sew it on as I wasn't sure if I had enough cotton and sure enough I didn't and there was no more. This was a real blow as the colour matched the lavender motif. 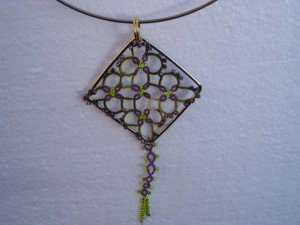 I was making it for a elderly lady who said she so liked to see lace/tatting around a handkerchief. Enter this bag, which I found in a charity shop, not a particularly wonderful bag, a canvas bag, but not wishing to just discard all the hours and hours of work I had put into the edging I attached it to the bag. Here is it finished, although you will have to enlarge the photograph to see the transferred edging! In my youth I used to associate the smell of lavender with "old ladies", they would very often use lavender toilet water (popular in England from 17th century; prepared by distilling freshly picked lavender that had been immersed in alcohol). Now lavender is back in fashion, and in an age of stress and depression it is often used to calm us down. Bathing in lavender oil, using a lavender pillow are all suggested to relieve tension and anxiety. Lavender oil can also be used in a massage, or in an oil burner to fragrance the room, the possibilities are endless. I even have lavender wax polish, finding time to actually use it is the problem! It is said that planting lavender around the house will help deter evil and protect the people within the household. The Romans introduced lavender and its uses into England and Europe. They used the flower heads in their communal baths not only for their fragrance but probably also as an antiseptic. The ancient Greeks are also thought to have used lavender for treatment of throat infections and chest complaints. A month ago there were purple fields of lavender to be seen in England and they looked beautiful in the sunshine. Today in the Christian church is the feast of St. Michael and all Angels. Michael the Archangel, Captain of the Host of Heaven who fought against Satan and his evil angels and cast them out of Paradise. Not sure which particular angel this one is though! It certainly has remained in my heaven, so it must be a good angel! 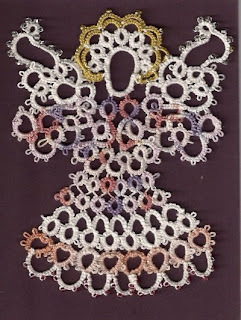 According to Mark Myers (AKA Tatman) it is called Patty's Angel, from his book Tatted Gathering of Angels, but sorry Mark it had a bit of a "make over" whilst in paradise, I added a few beads and omitted the heart in the centre. 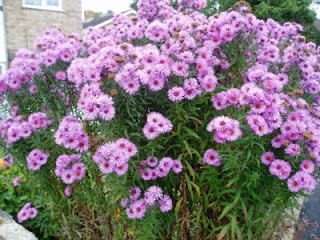 A photograph of some Michaelmas daisies, I went for a walk yesterday and photographed these, they were in someone’s front garden.Though not really a daisy at all, but an aster (and named after the ancient Greek word for star: ‘astron’), a late-bloomer that flowers in September and early October and called Michaelmas daisies because they are at their prime at Michaelmas Day. The one Michaelmas custom that survives to this day is that you should not eat blackberries after the 29th of September. There is a very good reason for this custom, namely that by this time of year blackberries are tasteless and watery. Although according to an old legend, it is because Satan, when banished from Heaven fell into a blackberry bush and cursed the brambles as he fell into them. It is also said that at this point the devil spat on the blackberries and they became poisonous so they are not to be picked or eaten after this date. 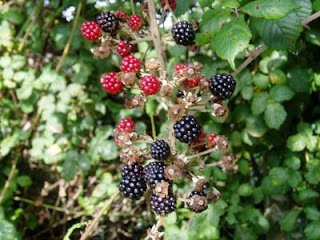 These particular blackberries were photographed by a church, and as you can see there are some yet to ripen. But of course its too late to pick them now! In medieval times the four quarter days were important holy days, namely: Christmas (25th Dec), Lady Day (25th March), Midsummer Day (24th July) and Michaelmas they were also the basis for financial calculations, and loosely coincide with the summer and winter solstices, and the spring and autumnal equinox. 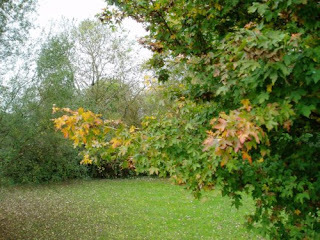 It is very autumnal here in England and the trees are starting to look particularly beautiful especially where I live on the edge of the New Forest. I am half way through tatting a leaf and hope to get it finished soon, but don't hold your breath! This photograph was taken whilst visiting family this weekend. 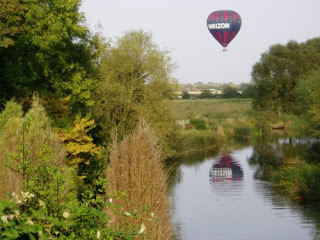 The hot air balloon has just taken off and I managed to get a reflection of it in the water. So I thought you might like to see it. So that's my "fly away" part of the post. 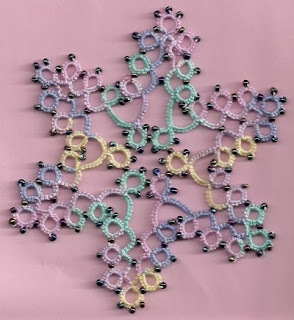 Since becoming a member of “tatting blog land” I have been so impressed by all the lovely work that you clever people have been doing, there is so much talent out there and it is good to share, especially the patterns. That’s where I fall short, because I find it such an effort writing the instructions down for an item that I have created. I tend to memorise what I’m doing at the time, thinking that it will stay in my head, then all too soon I quickly move onto another project and of course forget what I have been doing. I suppose that is being lazy, but it’s often the case that I just don’t have the time to do it properly so I end up not doing it at all! 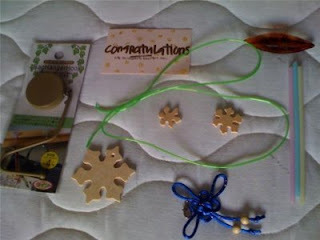 The other thing that has been so amazing is “blog giveaways” – now the rules for these can often confuse me! But generally all you have to do is comment on the blog, and the sheer generosity of the blogger is enough to make you want to say something. It is lovely to see the delighted recipients of the splendid giveaways write about their lucky wins. Also I’m pleased it keeps our postal systems going especially as we are using our computers such a great deal these days. I have given serious thought to what I could give away via the blog, but there is nothing that I posses that someone could possibly want! Unless you count the odd sermon!!! – No probably not. And of course I could not end this blog without mentioning Sherry’s Give Away Lady Shuttlemaker only it’s her parrot Mojo I want to win! Perhaps he can fly over here to the UK! Anyway good luck everyone, and thanks to all the generous bloggers who give so much away in time and talent. The only science lesson I can remember at school was when we were shown a prism and a white light was shone through it and suddenly there was a myriad of amazing colours, otherwise known as a rainbow. A rainbow is caused by sunshine (white light) shining on water droplets that are in the air just after a summer shower and some rainbows are amazing. It is often said that there is a pot of gold at the end of a rainbow! The necklace was made from the cotton that I won on e.bay, well actually I was the only person that wanted it, no competition! It is hung over a very old reject piece of Waterford Glass which was found buried in undergrowth. 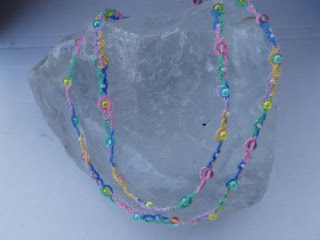 The cotton that I made the necklace with was listed as rainbow cotton, although it does not truly have all the colours of the rainbow in it. Neither for that matter does the song ...........I can sing a rainbow, intended to teach children the colours of the rainbow. Which turns into this little phrase "Richard Of York Gave Battle In Vain"
I really am sure that I didn't need the five balls of rainbow cotton which I won on e.bay! 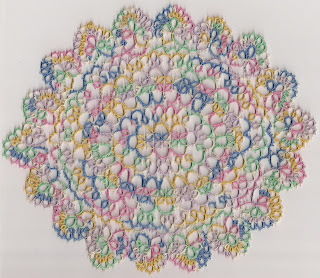 Whilst in the attic this week I found the tatted doily, no idea when I made it, or where the pattern comes from, but it was tatted in DMC 80 so it must have been a labour of love! 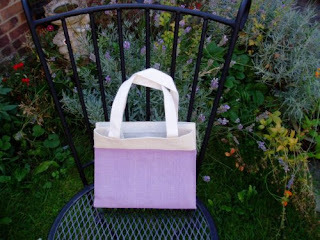 Since blogging I have been really impressed at the hand dyed threads I have seen. Whilst visiting Tatskool she showed me the very long and complicated process of dying cotton and I had no idea that there was so much work involved. Naively I thought you just dipped the thread in some Dylon and hey presto! But I was so wrong. and it is smells of Passion Fruit/Guava. But look what is trapped inside it?! I think it belongs to Tatskool's husband! 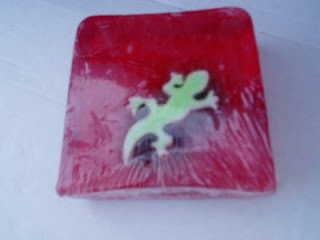 But did they have to break this poor Gecko's foot?! Find the colours of your rainbow at spacefem.com. My rainbow was shaded brown and white and this is what it said about me "You are a contemplative person. You appreciate the roughness of nature. People depend on you to make them feel secure. You feel closer to people when you understand their imperfections."